I have written about this before, but it bears revisiting. This is an incredibly simple way to get multiple meals. The great thing about cooking a whole chicken in your slow cooker is that you put the chicken in the crock pot and turn it on. It’s (almost) that simple. You don’t need to add any liquids because the chicken provides plenty of liquid. I cooked the chicken on low for eight-and-a-half hours. Next time I need to remember to rub the spice mix under the skin. Otherwise it turned out great. The chicken cost a little less than twice what we pay for a rotisserie chicken at the grocery store. We generally get two meals out of a rotisserie chicken. This one yielded four: that evening’s supper plus three bags sealed up in the FoodSaver and put in the freezer. The math certainly works. 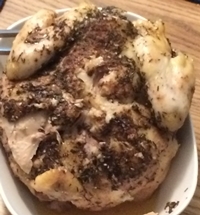 I have a number of recipes in my database that call for using rotisserie chicken. The crock pot chicken is, certainly, a perfectly fine substitute for that, and I don’t have to worry about going out and finding a rotisserie chicken. I just pull it out of the freezer. There’s a lot to be said for chicken in the slow cooker.